Our trek northward continues, but as we get closer to our destination, our rate of travel seems to be slowing. I don’t think this is because we don’t want to arrive, it’s just that we keep finding things to do. And since Emma is now up in Vermont with her grandparents, there is much less pressure for us to arrive. Let’s face it, everyone wants to see Emma, and we are just the follow-up act. 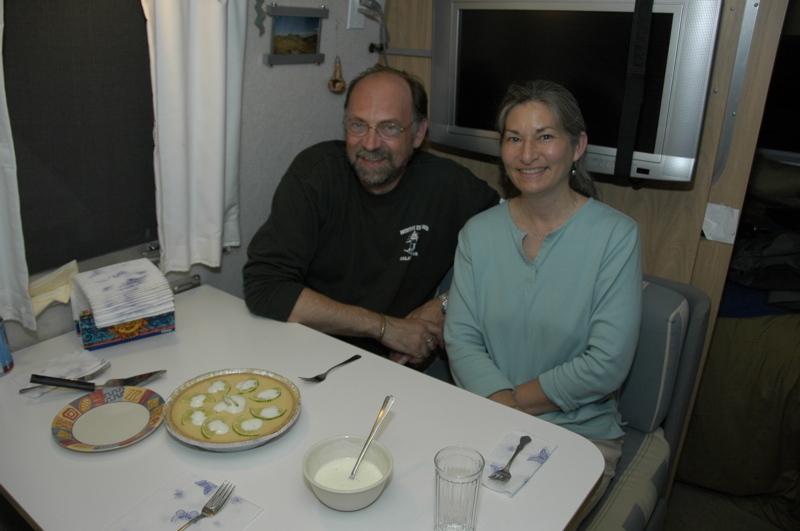 … which is actually nice for us, because this way Eleanor and I are getting some time alone together in the Airstream (a rarity). We have lots of time to talk, but also plenty of long quiet pauses to gather our thoughts. There are many things to think about: our plans for the summer, our trip west, things to do on the house when we get back. By the time we get to Vermont we’ll have a lot of stuff worked out. The hitch people solved the problem that baffled the Nissan dealer, and did it in about an hour. The little squeak that started all this is gone. The hitch is now well attached with two new bolts up front, and they even gave me the old bolts back. As we deduced, the nuts that were originally attached to the frame had broken free, and once the bolt worked loose, there was no way to tighten it. I would recommend that anyone who has a Nissan Titan or Armada used for a lot of towing should check the bolt torque periodically to avoid this problem. With that resolved, it was time to pull out of Colonial Airstream’s lot and get moving north. I was dreading the trip up the Garden State Parkway, but it turned out to be a light traffic day and so I didn’t have to do the usual suburban beltway dodge-em. 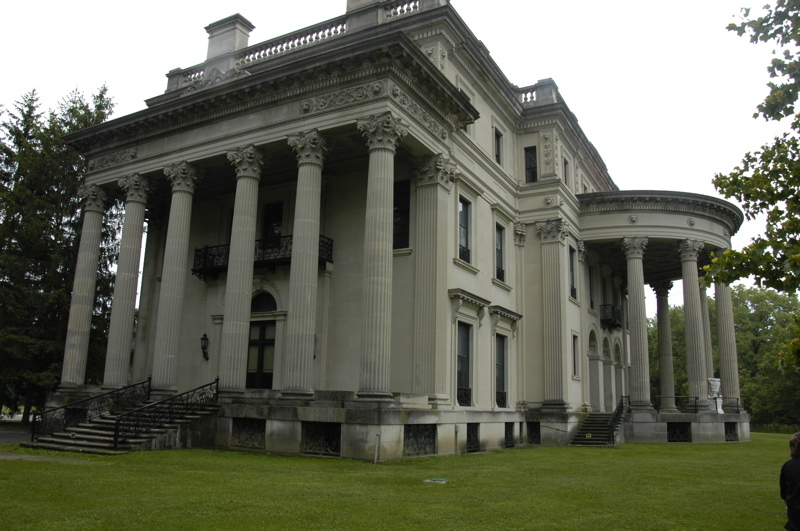 We moved about 160 miles north to Mills-Norrie State Park in New York, near Hyde Park. As state park campgrounds go, this one is pretty rough. The roads in the park are riddled with huge potholes, and the camp sites are just rough clearings in the forest. It is perhaps a typical old New England state park campground, but we’ve gotten used to the better ones in other parts of the country, with niceties like level gravel pads. Turns in the campground are very tight and in some places impossible for our 30 footer, so we had to get creative to get into our site. After some head-scratching, we pulled around and drove across another site to do a pull-through. Eleanor had to hold back some tree branches, but we finally got in without damage. Our site is extremely un-level, as are most of the sites in this park. We got the trailer almost level but had to use the full extension of the tongue jack and all of our leveling blocks on one side. I also had to put a rock under the front right stabilizer because it couldn’t reach the ground. Despite the hassle of getting parked, now that we are settled in, I can see that the campground is nice and quiet, reasonably scenic, and the mosquitoes are not a problem during the daylight hours. With good friends camped nearby I expect we’ll have a nice time, and those will be provided tomorrow night. We’ve invited our friends from Connecticut, Rick and Sandi, to come out and join us for the weekend. They’re coming with their 23-foot Airstream. We haven’t seen them since we went caving in upstate NY last September. The past 48 hours have reminded me of the difference between good and bad service. We brought our Safari into Colonial Airstream to have a leak repaired on our front compartment. When we tow in wet conditions, water gets into the front compartment. This problem has been plaguing us for over a year, and nobody has been able to solve it. Our solution has been to put packing tape over the door frame, which has stopped the wind-driven water from blowing in. 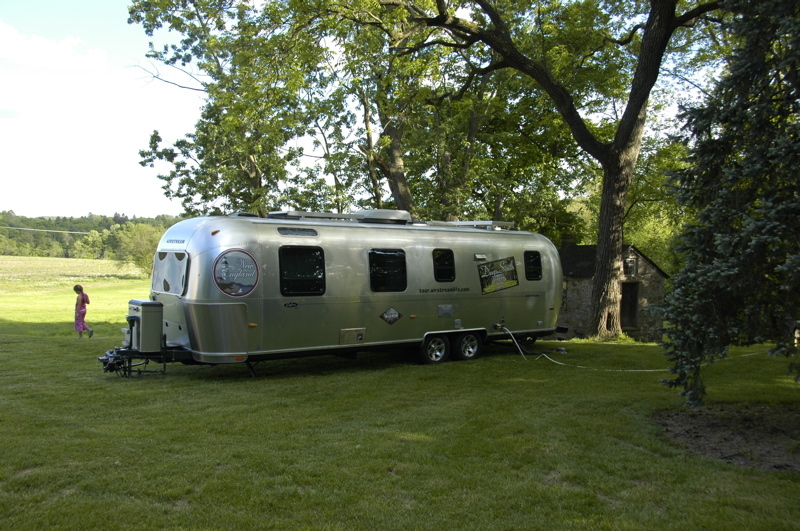 But it’s not an elegant solution and so finally we brought it to Colonial Airstream for a real repair. Tony Cursi, Service Manager, has been absolutely great. The week before we came in, he requested digital photos of the area so he could plan the solution. 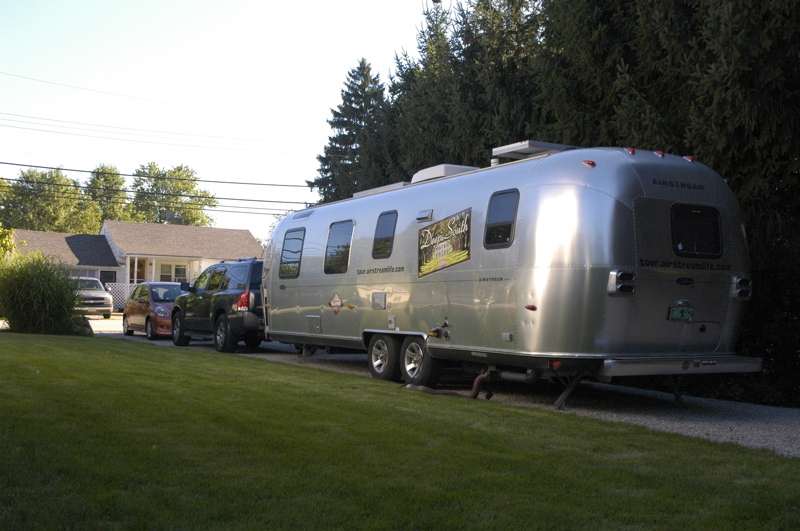 Then he got on the phone with Airstream’s service experts and got their advice. When we arrived, he had parts on hand and spent time with me to review his ideas even before we were unhitched. In the end, the solution was to remove the compartment door, re-attach it a bit straighter than it was originally made, add reinforcing metal behind the lower corners to eliminate some cracking that was happening there, re-riveting, caulking, adjusting the gasket, and doing other sealing work along the lower edge. Tony thinks the solution will prevent further leaks, and I’m hoping he’s right. Bottom line: the work got done professionally, they worked with me to come up with a good solution, and the job was done quickly. If that was the end of the story we’d have left today and headed on our way. But we still needed a fix for the Nissan’s hitch. Let’s contrast my customer service experience with the Nissan dealership I took our Armada today. Our hitch was suffering a problem of two forward bolts coming loose inside the frame. This is admittedly a tricky problem, but we hoped that if anyone could handle it, the dealer could. But when we dropped off the truck, the service writer looked unhappy about it and said, “I’ll see what I can do.” I also asked them to change the oil since we were there.An hour later he called to tell us that the bolts could be tightened for $50. He also said we needed a coolant flush, transmission and rear differential fluid replacement, an engine air filter, in-cabin microfilter, air conditioning “service” (a recharge), an alternator drive belt, and had a leaking rear differential seal. Except for the air conditioner, belt, and leaking seal, that’s basically a 60k service interval which we just had done 6,000 miles ago. It’s a $700 pile of services. I was annoyed because every Nissan dealer we’ve visited has had full access via computer to our service records, and it was obvious that they were just trying to pad our bill with a heap of stuff we didn’t really need. I should have just bailed out and gotten the essential services elsewhere, but I told them to go ahead on the things we really needed: the belt, air conditioner recharge, and leaking seal (the latter covered by warranty). They’ve made me regret that. The car was dropped off at 12:30 Tuesday, and promised by end of day or at least Wednesday morning. At 2 pm Wednesday they called to say they couldn’t figure out how to tighten the hitch bolts after all, and that the car still wasn’t ready for pick up. We finally the car back at 4 p.m., too late to go much of anywhere, and with the essential problem of the hitch still unsolved. So we talked to Tony at Colonial (not a long walk since we are parked next to his office) and he immediately hooked me up with a trailer hitch specialist a few miles away who can easily handle the job. They will remove the hitch and the stubborn bolts, tack weld a new nut to a piece of coathanger, feed that nut in through an access hole in the frame, and reinstall the hitch. That’s the right way to do the job. They’ll also use lockwashers and I’m going to ask them to add some Loc-Tite too, so it won’t come loose again. My father, an amateur aircraft builder, recommended some “inspector’s paint”, which is another good idea. Tonight we are staying in the Colonial Airstream lot, surrounded by the other 64 new Airstreams they have in stock, and sharing the lot with a couple of new owners who are spending the night in their Airstreams before taking delivery tomorrow. It is actually rather nice. The weather has turned from humid and hot yesterday to beautifully cool and springlike today, which seems to be putting everyone in a great mood. 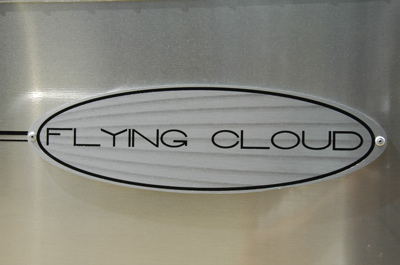 And, we have the opportunity to check out the new Airstreams, which include the very sweet Flying Cloud models, and hang out with Pat & Lauren Botticelli, a newly-married husband and wife team who share the Airstream sales duties. I’ll probably have more those things tomorrow. Secluded here on the green lawn behind hedges and shaded by tall trees, with a view to open fields being plowed, it has been easy to forget the world outside. I nearly forgot it was Memorial Day. We made no plans other than to walk the downtown of New Hope, and to get prepared for our tow to Colonial Airstream tomorrow. We got the Airstream hitched up to our hosts’ 1996 Suburban, and towed it around town a little to get the brake controller dialed in. We were lucky that the receiver height on the ‘burb was about the same as our Armada, and the brake controller is compatible with our electrically actuated disc brake system as well. 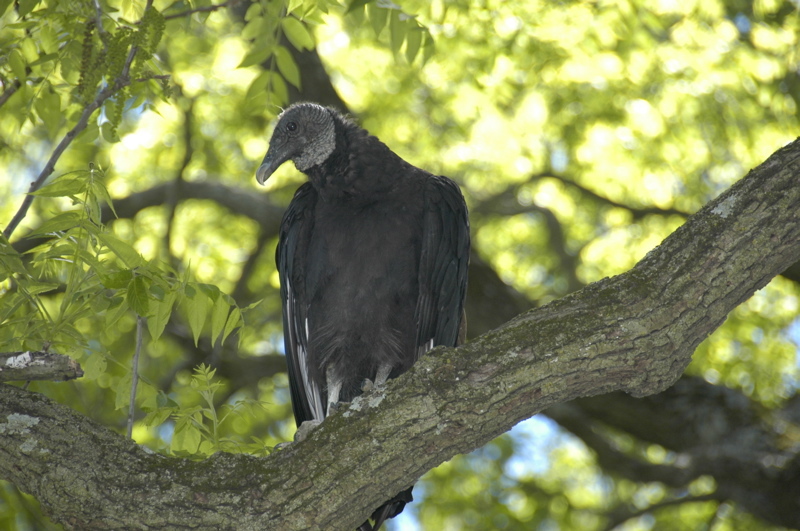 I was beginning to think the vulture who parked himself over our Airstream was a bad omen, but it turns out he was just curious. We seem to be all set to use Peter’s truck to tow our Airstream for the day. Transitioning to it from the Nissan was a no-brainer. The plan is this: in the early morning Emma’s grandparents will swoop in and take Emma off to Vermont. Eleanor will drive the Nissan following me while I drive the Suburban (with Airstream) to Colonial Airstream. We’ll drop the Airstream there for its service appointment, then drive both trucks to the Nissan dealer nearby where we will drop the Nissan for its service appointment. Then we’ll return to New Hope (70 miles away) to pick up the Honda, drop off the Suburban, and return once again to Lakewood NJ to the Airstream. 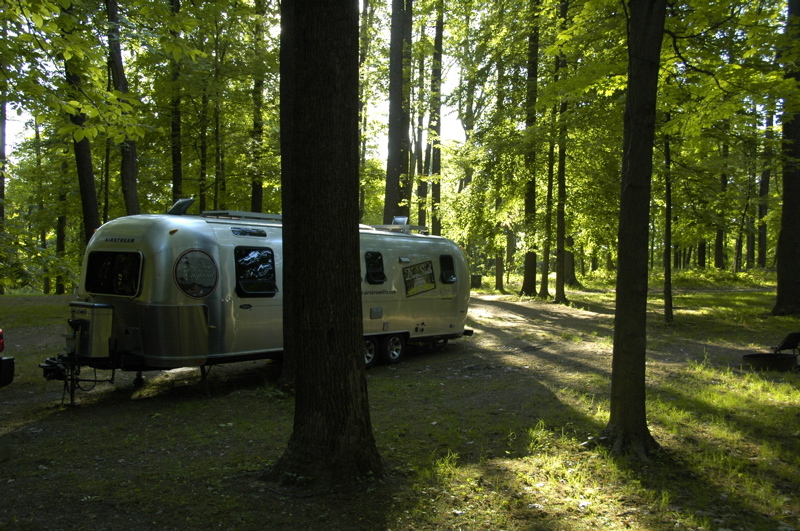 After about six hours of shuttling vehicles around New Jersey, I think we’ll be ready for a break, but our Airstream’s bedroom will probably be gone by then as a result of the nature of the work that is planned. So the plan is to check in at a local hotel for the next two nights. We will catch up with Emma in Vermont in about a week, hopefully with all of our equipment back in perfect order. We’ve really undershot the potential of this area. There are interesting things to see and do everywhere, and we’ve missed most of them, in favor of just hanging around. That’s not like us, but with all of the logistics planning, it was probably the best thing to do. I got ahead on some Fall 2008 magazine work on Sunday, which will make the complicated week to come somewhat easier. We will probably get another chance to explore the towns and surrounding attractions the next time we are forced down I-95. Good stops along that highway are hard to find, so this courtesy parking opportunity will be added to our permanent list. I’ll get the maintenance item out of the way first. The forward right-hand bolt on the receiver hitch that I spoke of yesterday is not broken. It threads into a “blind nut” that is welded inside the frame. Apparently at some time in the recent past, the blind nut broke its weld, and the bolt loosened. 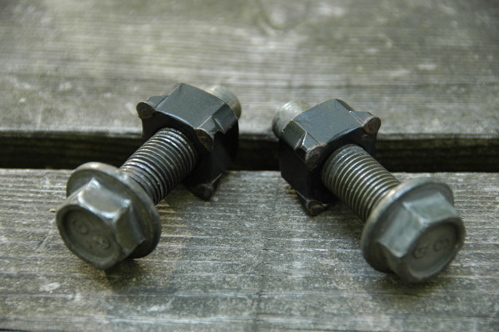 With the nut no longer attached to the frame, there’s no way to tighten or loosen the bolt. We can’t reach the nut because it is inside a fully boxed frame member. The nut just spins inside the frame when we turn the bolt. Moreover, during investigation we found that the other forward bolt (on the left hand side) has the same problem. The weld holding that nut has broken as well, so that when we went to tighten it, it just spun. And the remaining four bolts were all looser than they should have been, although still well attached. So the Armada now has a service appointment at the local Nissan dealer for next week. Both the Airstream and the Nissan are going in on Tuesday. With only four bolts really holding the hitch on, however, the Nissan is not fit to tow the Airstream. We are planning to borrow a Suburban from our hosts to shuttle the Airstream to its appointment, and we are borrowing a driver to shuttle the Nissan to its appointment, and Eleanor will follow in the Honda to move people around from one place to another. Somehow we will make it all work. 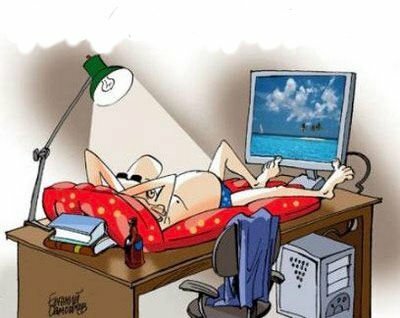 With that resolved, we are going to just enjoy the local area for the rest of the long weekend. 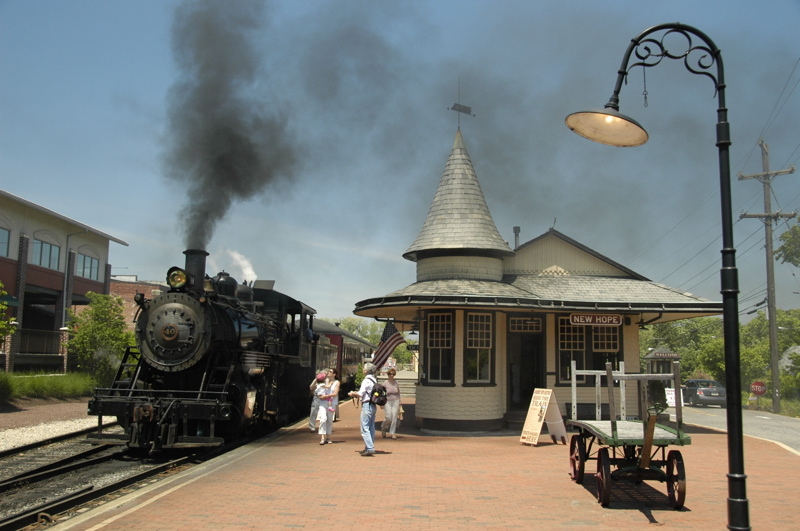 New Hope and nearby Lambertville are interesting towns surrounded by beautiful countryside. 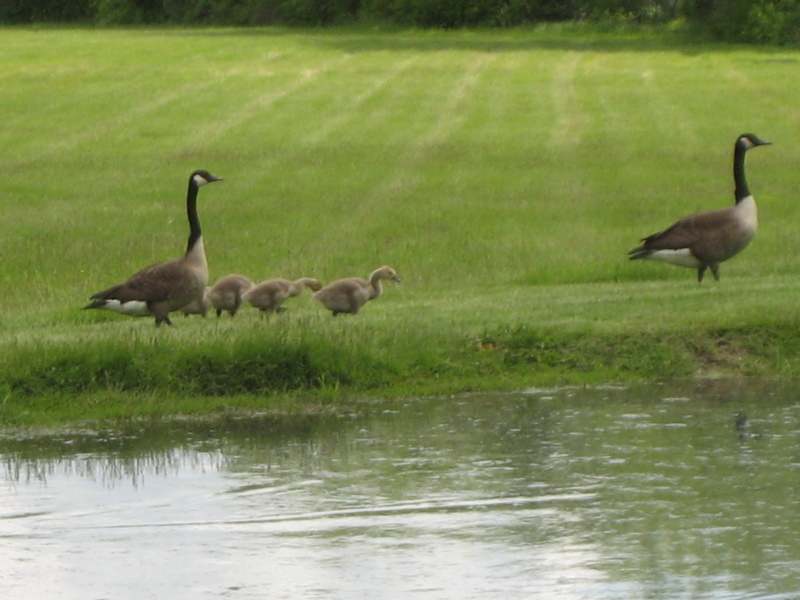 Our courtesy parking spot by itself is absolutely gorgeous, with long sweeping views across green fields, deer near the edge of the trees, and geese hanging around the pond. 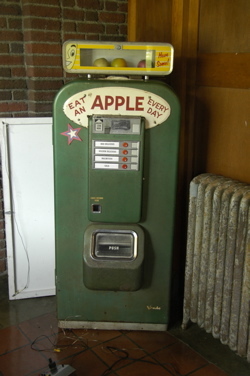 We dropped in on a locally famous old flea market this morning, and tomorrow we’ll check out more of the area. It looks like we may not go to Philadelphia after all. It’s a longish drive and there’s more than enough right here to keep us occupied. One advantage of using our trailer frequently is that we get to know it very well. We know exactly what to expect from it, and when something is not right it’s usually very apparent. We anticipate the stance it takes when it sits in a campsite with all tires fully inflated. I know the “happy noises” the truck, hitch, and brakes make when they are operating normally. I recognize the “seat of the pants” sensations that come with accelerating, turning, braking, and bumps. Everything flows along like a familiar song, which is what you want, because it sensitizes you to any off key notes. A few weeks ago, in Florida, I started to hear an odd little squeak during towing. It was very faint, just the slightest hint of metal parts gently rubbing. It was a new sound, and new sounds are not welcome in the trailer song. So in Fort Wilderness, I took apart the Hensley hitch, thinking it needed lubrication on the tow ball (a procedure we do at least annually). But that didn’t solve it. The noise wasn’t loud and it didn’t sound “expensive” but it bugged me because it shouldn’t have been there at all. It re-appeared again from time to time, and when it did I’d wiggle various things on the hitch, trying to find something a bit loose, needing lubrication, cracked or perhaps rusted. I also crawled under the Armada to look for cracks in the hitch. But I couldn’t find any cause for the the noise. What was really maddening is that the sound seemed to have no pattern. Sometimes it was there, and then it was not. I’d hear it when the trailer was gently jiggling over slightly rough pavement, but on really bumpy roads it would go away. I’d hear it at slow speeds sometimes, but not when going fast. It was just soft enough that if I turned on the radio I wouldn’t hear it, but I couldn’t do that. It wasn’t supposed to be there. Today I heard it again during our tow up from Assateague State Park to I-95. Finally, at a rest area in Pennsylvania I stood on the hitch and bounced it up and down, and after a few bounces I was rewarded with the squeak. It was coming from under the Armada. So I got Eleanor to stand on the hitch and bounce up and down while I crawled under the truck again … and I heard the squeak coming from the factory Class V tow hitch. It has six large bolts which attach it to the truck frame, three on each side. I looked very closely, and compared one side of the hitch to the other. Finally, I saw that the hitch was not contacting the frame on the right side as tightly as it should have in the area of the forward-most bolt. There was a 1/8″ gap between hitch and frame at that point. It was hard to see even with a flashlight (because a hot exhaust system was blocking my view) but it appears that the bolt may have broken at the stem, or stripped out of the frame. That’s very bad. Very very bad. How bad? Well, it’s a good thing that the Nissan engineers designed a lot of redundancy into this hitch design. 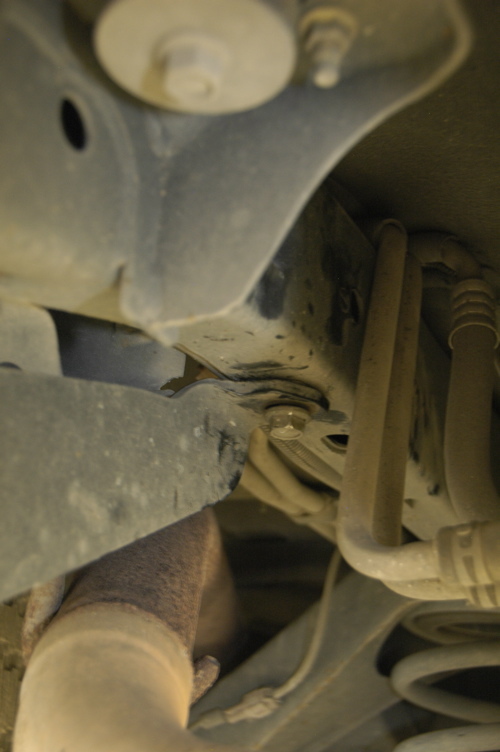 If not, the remaining two bolts on that side could have failed at any time in the last 1,000 miles of towing, causing the hitch to partially separate from the truck. 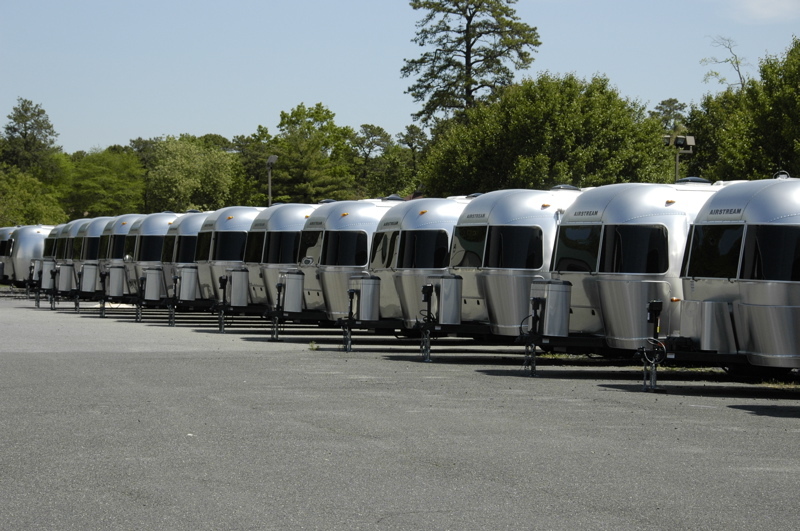 Then, the Airstream would have been an 8000 lb anchor with a mind of its own, pushing asymmetrically on the Armada. Ever see those cop shows when they give a little push on the bumper of the bad guy’s car, and it goes spinning out of control? Imagine that with a 30-foot trailer attached. You don’t want that to happen. And all that from a little squeaking sound. So here’s the moral of the story: learn the song your rig sings as it goes. Know how it sits, how it rides, and what it does at every turn. A little squeak may be all the warning you get, but it will be enough if you are in tune with your rig. Things like this seem to always happen on the Friday before a three-day weekend, don’t they? Fortunately we were near Star & Peter’s house when we discovered the issue, and Peter is a master mechanic with an incredible workshop. We’re parked on their lawn with a full hookup now. Tomorrow we will get a good look at the problem and I am pretty sure Peter will be able to fix it. I’ll get photos for the blog and post them over the weekend.